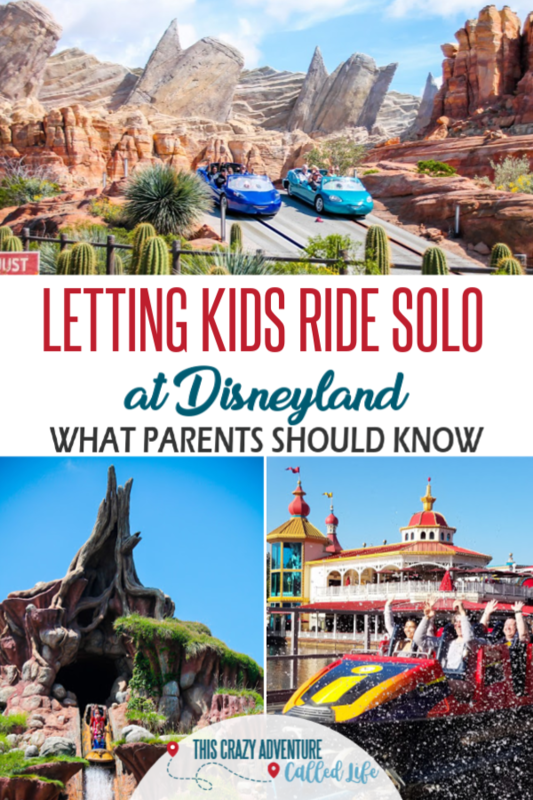 Can Your Kid Ride Alone at Disneyland? Should They? Maybe you are heading to Disneyland with more kids than adults. Or maybe you have a child that wants to do a ride you just can’t stomach. For whatever reason, there may be a time when you or your child are wondering if your kid can ride alone at Disneyland. Or with another sibling. Or maybe you are wondering if they should, even if Disney says they can, because can and should are two different things. Let’s talk about letting kids do rides alone at Disneyland. This one won’t be riding alone for several more years, thankfully. 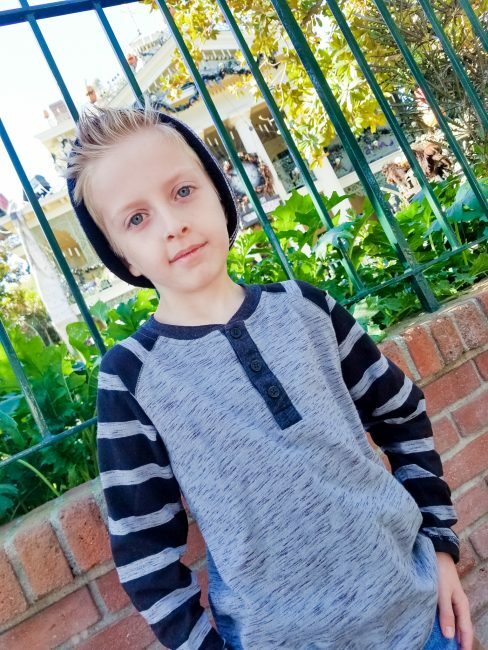 Yeah, that one is not going to happen for a while, but over our last few trips we have started letting him do a little bit more at Disneyland on his own. 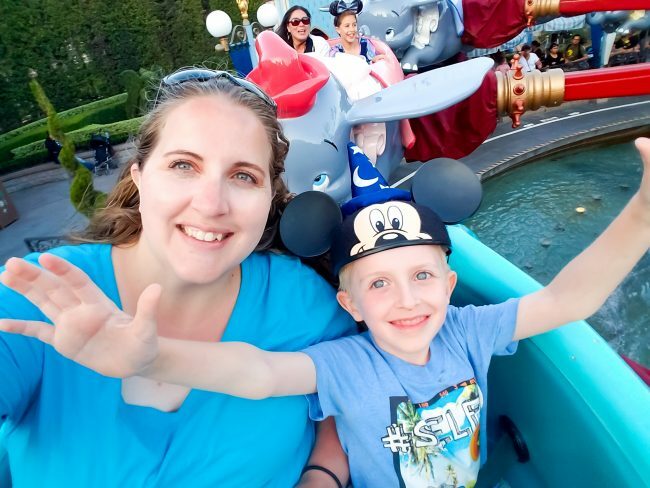 So I am going to share the info, tips, and more on letting kids ride solo at Disneyland. Also, just a note, my oldest child is special needs. He is on the spectrum and has ADHD, for which we utilize Disney’s Disability Access Service, but he is still very capable and independent about certain things. 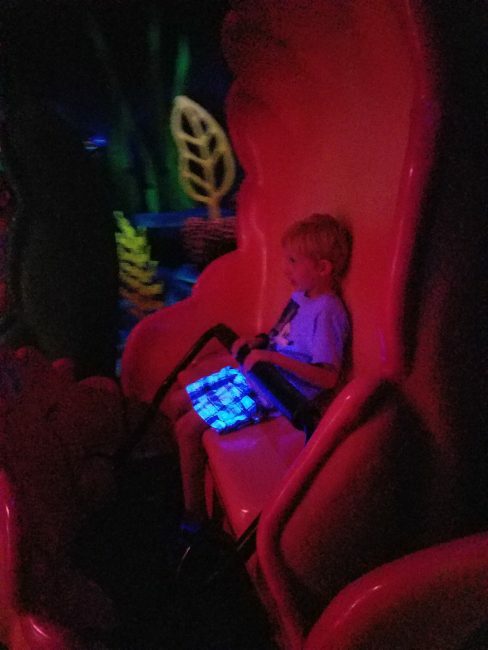 Why Would A Kid Ride Alone At Disneyland? First off, many of you might be wondering why would a kid even need to ride alone at Disneyland. There are several reasons a child might need to ride alone at Disneyland. Maybe you have a large family and only two parents, or maybe you are one parent taking multiple kids. Chances are you may encounter a ride where the seating situation means someone has to ride alone. This has become the case with our family as our twins get older and do more rides. Especially when I might have to split off from the family for work and my husband is trying to manage all three children. 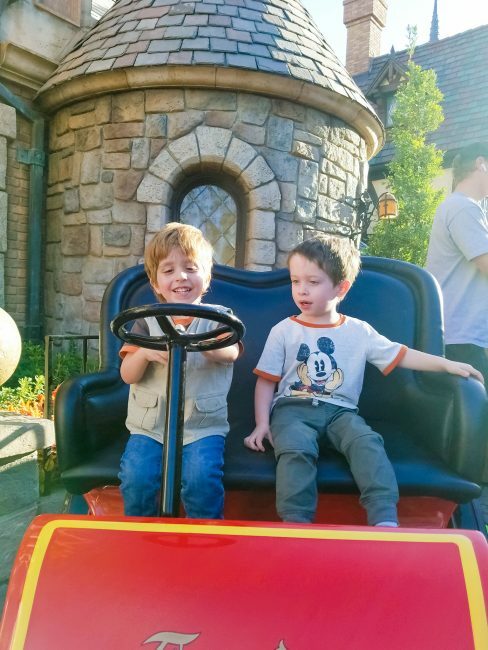 While I was attending the Disneyland Holiday media event, my husband took all the kids around, and many rides my husband could ride with both twins, but not with my son, so my oldest had to ride alone. Many time parents need to sit out with smaller children on rides, or another child may be scared to do a certain ride. While a family could choose to skip a ride all together, you could also choose to let children ride alone, or split your group up and utilize Rider Switch Pass. Sometimes though, again, you may only have one parent, so riding alone is the only way the child will get to ride. This was the case the first time my son rode alone. We were at Disneyland for Halloween time, just he and I and a friend of mine. He really loves Goofy’s Sky School, and that is one ride that both my friend and I can not handle. So he rode it alone. So what are the official guidelines regarding kids going on rides alone at Disneyland? Disney has some pretty clear-cut rules for most rides. Children under the age of 7 must be accompanied by another guest age 14 or older. Seems pretty simple and straightforward right? Well, kind of. Because each attraction is different, that under the age of 7 rule can be a bit unclear. 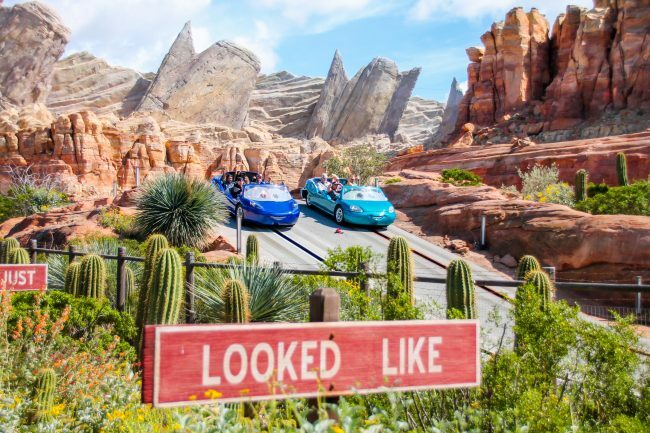 The Goof rode Radiator Springs Racers and other big rides alone for the first time recently. What counts as riding alone? This is where things get sticky… What does Disney consider riding alone? Honestly, this may vary based on each cast member. In March my then seven-year-old took his two-year-old brother in a seat with him on Golden Zephyr while my husband rode in front of him with the other two-year-old. Not sure every cast member would have allowed that. 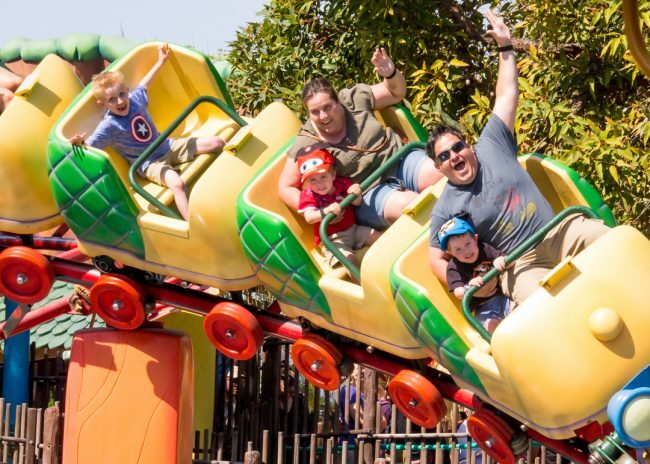 In general, if you are in the same ride vehicle, children can ride in their own row (or with other children) as long as a guest of 14 is in the same vehicle with them. Again though, what is considered a vehicle is up for debate. Going on Gadget’s Go Coaster, and you might think that the entire coaster vehicle counts, but nope… each row is a car, and so your six-year-old cannot sit behind you one or two rows. Some rides are pretty easy to know what counts, and some aren’t, but if there is any doubt, we suggest planning on having a child under 7 ride with someone over the age of 14. What rides do not base it on age alone? Even if your child is 7 or older, they may not be able to ride alone. Autopia has a second height requirement for riders to be able to ride alone. This has to do with seeing over the dash and being able to reach the pedals. Silly Symphony Swings requires guests between 40-48 inches to ride with a responsible person in a tandem swing, even if they are 7 or older. Should My Kid Ride Alone? So how do you know if a child should ride alone? Are they familiar with the ride? I suggest starting out with rides that they have gone on many times, know and love. They are comfortable with these rides and won’t be scared of them. This may mean letting them ride in their own shell on Ariel’s Under Sea Adventure, or fly in their own elephant for Dumbo the Flying Elephant. This will help gage how they do alone, if they listen to cast members, and if they are suddenly afraid right before riding. Can they fasten and unfasten ride safety belts/harnesses? If you will not be there to assist your child, will they be able to fasten and unfasten their belts or harnesses? Cast Members are sometimes willing to help, but it is best if your child can do this on their own. Are they responsible on rides? Does your child follow the safety tips on rides of keeping their arms in and remaining seated? Does your child know not to climb on the rails in the queue? These are some things to think about when letting them ride alone. Are both you and your child comfortable with them riding alone? This is probably the most important part. Oddly enough, my son does not like to ride Dumbo the Flying Elephant alone. I don’t get it, but he doesn’t like it. So on that ride, he rides with someone else. If either you or your child are not comfortable with them riding alone, then don’t do it. Oddly enough, my son doesn’t like to ride Dumbo the Flying Elephant alone. Of course, once you know your child is ready, and allowed, to ride alone, you may still need some tips. We got you covered. Be prepared for their age to be questioned… a lot. 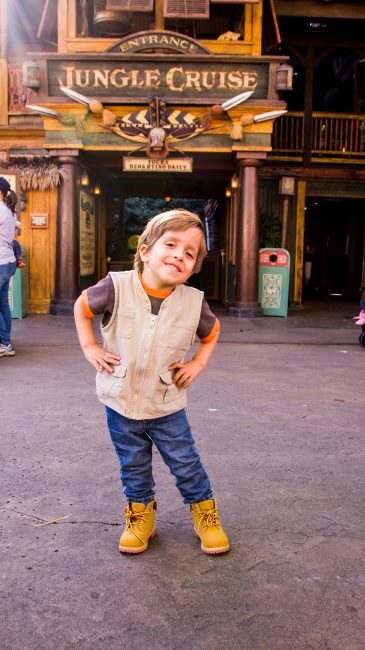 First, know that if your child is small, or even if they just look young, cast member may double or even triple check their age. They rarely ask the parent the age either. They will ask your child. 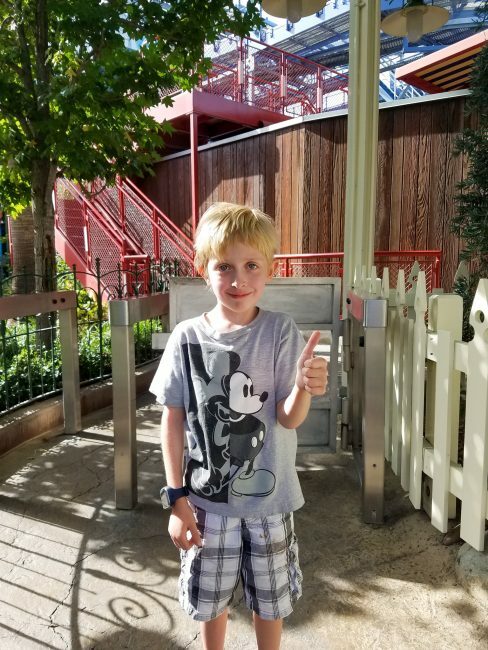 In fact, our son has become so used to being asked, as he boards a ride he goes “I am eight.” I am sure cast members think he was coached because he offers the information before they even ask, but he just knows he looks very young for his age, so he tells them immediately. He loves the Haunted Mansion, even though they stopped the ride to verify his age…again. The first time I let the Goof ride alone, as in nobody else did the ride, was that time on Goofy’s Sky School. Because it was his first time, and I was worried if he would remain calm when cast members asked his age, and when it was time to ride, I waited in line with him. Most rides have a “chicken exit” for those that decide last minute they do not want to ride, or the loading and unloading is in the same spot. You are welcome to wait in line with your child and then exit the line when they load up. Before letting your child go on a ride alone at Disneyland, make sure it is clear where you will meet up after the ride. Will you meet them right at the exit? Will you meet them nearby? Be sure everyone is clear on where you will go and meet up after the ride. Also be sure your child knows how to get where you are if you choose to meet somewhere other than the exit. You don’t want a child lost at Disney. Utilize Single Rider or Fastpass and MaxPass to shorten the time your kids are on their own. This makes it so you are not waiting forever for them, but it also allows you to have more time together as a family. Let them know what your expectations are as far as riding together and riding alone. This will help prevent meltdowns, misunderstandings and even fights. And now, you can breathe. You have mastered letting your kid ride alone. You are set until they decide they want to go off on their own in Disneyland Park completely. Did you know that kids count as adults starting at 10 years old when buying Disneyland tickets? There is a lot you need to know before buying Disneyland tickets, but one of them is that you can save money by purchasing through our preferred ticket partner Get Away Today. You can even lock in your vacation and pricing for $175 down. If you book a package deal, you may also get free hotel nights, reduced or free parking, and more. Plus save $10 on qualifying packages with code CrazyAdventure when you book through my link by clicking the picture above. My boys are super small for their age, too. This info is really helpful.